Hearing aids need regular maintenance to ensure 100% performance. We recommend scheduling an appointment for a hearing aid cleaning and performance check every 6 months. It is an easy way to keep your hearing aids working at peak efficiency and as part of our service guarantee, Polo Park Hearing Centre provides routine maintenance free of charge for the life of your hearing aids. Routine maintenance is free of charge for the life of your hearing aids. 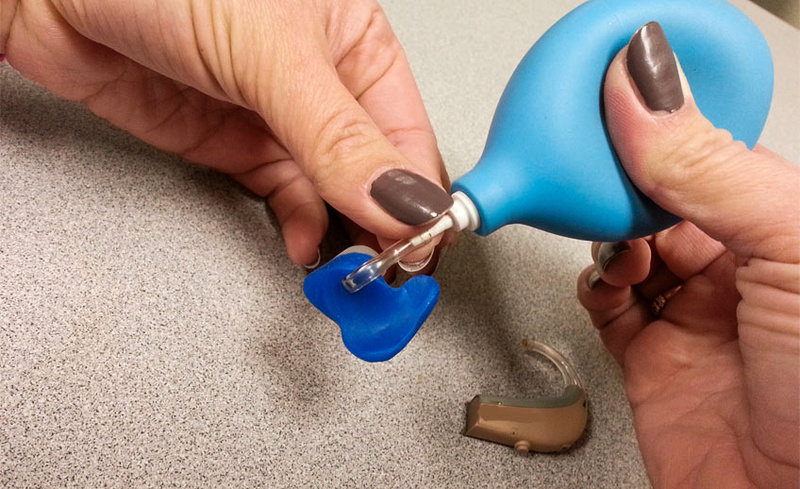 While cleaning your own hearing aids on a regular basis is very helpful in maintaining good day to day performance, during a 6 month cleaning and checkup one of our Hearing Instrument Specialists will clean areas where regular cleaning tools can not reach. One such area is the microphone itself. Also, some hearing aids such as the Behind-The-Ear (BTE) style hearing aids have a replaceable plastic tube that connects the hearing aid body to the ear mould. The tube often becomes brittle over time and is difficult to clean so it is considered regular maintenance to replace item from time to time. In Manitoba we live in an extreme environment with a wide range of temperatures from the very hot to the very cold. That combined with the nature of the tiny, sensitive electronics packed into a small housing, regular checkups are a good idea. If moisture becomes a problem over summer, there are moisture proof containers that will dry all the hearing aid’s components overnight. If for any reason your hearing aids should not sound clear and become weak or scratchy, call us to make an appointment for a quick maintenance check – it’s free and part of our service guarantee. Call us at (204) 788-1083 Monday to Friday between 9 a.m. and 5:30 p.m. or Saturday between 10 a.m. and 2 p.m. Alternatively click contact us online. Next PostHow Much Do Hearing Aids Cost?